Getting involved in a group class is a great way to experience making music with others. There are numerous group classes, both on going and one time only, offered for both young students and adults. This group performs regularly around the Valley. 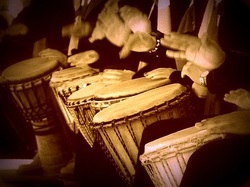 - Community Drum Workshops for Adults. Please read information below for next scheduled class. individuals and build communities. This spring Dr. Meggie Aube will offer a 3 week workshop in community drumming. Classes will be held on Saturday afternoons from 1:00- 2:00 p.m. on April 6th, 13th, and 20th. The fee for the 3-class workshop is $30. This workshop is offered for adults age 18 and older. No prior experience in drumming is necessary, just a willing and creative spirit. Throughout the 3 weeks, participants will learn to unleash their inner creativity with rhythms while also learning grooves from around the world.